Anna and Amaia's blog: Wheeeeh! 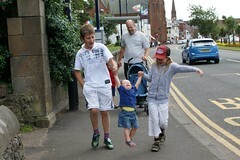 When we go out walking my biggest brother and sister sometimes like to take me by the hand and swing me in the middle. They always seem to be having so much fun I have to let them carry on just to humour them!